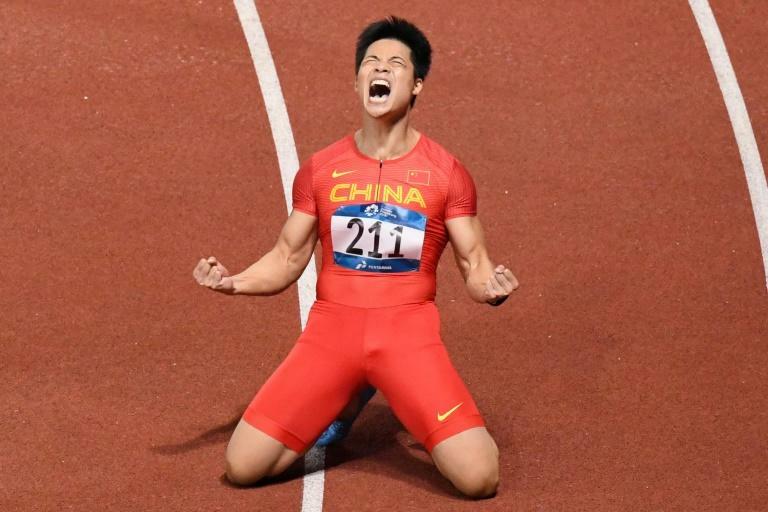 Su Bingtian's Asian Games gold in the 100 metres came as little surprise to many, including athletics boss Sebastian Coe, long an admirer of the pint-sized Chinese sprinter. The 28-year-old streaked to victory in a competition record of 9.92 seconds in Jakarta at the weekend, missing the continental record by the tiniest of fractions. Su edged out Nigeria-born Qatari Tosin Ogunode -- younger brother of Femi Ogunode, with whom the Chinese star shares the continental best of 9.91 -- on a night when six African-born athletes bagged six track and field golds at Asia's showcase sports event. Ryota Yamagata -- part of the 4x100m Japan team that took silver behind Usain Bolt's Jamaica at the 2016 Rio Olympics, took bronze, underlining Coe's confidence in the future of Asian sprinting. "You could argue Japan and China are two of the most improved athletics nations over the last six or seven years," the Briton said in an interview with news agencies. "For me it's very clear -- they're making very good progress. If we'd been sitting here a decade ago, talking about potential here for a China athlete to run 9.8, you'd have probably taken quite long odds on that." Coe, president of track and field's governing IAAF, pointed to China's willingness to embrace overseas coaches after years of fostering suspicion of state-sponsored doping. Su is coached by American coach Randy Huntington, while swim star Sun Yang's partnership with Australian Denis Cotterell has helped turn him into a world-beater. "If you look at the Chinese federation, they've been quite global," said Coe. "They've recognised there are gaps in their own coaching structures and said 'hey, let's bring that talent to the table'. "It's a pragmatic approach. There's been a greater clarity around the importance of coaching." Coe is aware of the massive void left by athletics mega-star Bolt after the Jamaican legend's retirement last year. But he also wants athletes to be personalities who can connect with fans. "I'm a boxing fan," said Coe, twice an Olympic 1,500m champion. "If we'd been sitting in the 70s, you'd probably be saying to me what on earth are we going to be doing after Muhammad Ali? But actually, Floyd Mayweather, Hagler, Hearns come along. "Do they suddenly replace Muhammad Ali? No. Should we suddenly expect these athletes to replace him? No," he added. "Because Usain is not simply thought about at the status that he's thought about because he's got a sack full of world records and he's got a clutch of Olympic titles. "It's actually because he's a personality. It's performance plus personality. We've got to help the athletes tell their stories." Su himself is a superstar in China, although he has some way to achieve the celebrity that pin-up Liu Xiang achieved after winning 110m hurdles gold at the 2004 Athens Olympics. "There was more pressure here than at a world championships," said Su, swallowed by a scrum of state media after his win. "Everybody expected me to win so I kept telling myself to stay calm. I just found a way. It's a massive victory for me."